When you listen to the political debate, one level above the tedious, daily who-colluded-with-Russia chatter, there is actually an intellectual conversation going on. Or, to be accurate, two conversations. There is one conversation among conservatives about whether or not President Trump and Brexit represent triumphant conservatism or unpalatable nationalism. It is, in other words, mostly an introspective conversation where conservatives try to find a new footing in what some have characterized as a post-20th century economic and political environment. The other conversation takes place on the left, and is equally introspective. It has been running for a much longer time than the conservative discussion, starting, in fact, with the collapse of the Soviet Union 26 years ago. To paint with broad strokes, the left spent the 1990s defining itself in what was then defined as a "mono-polar world" where, as it was said, capitalism had won; the 2000s gave the left confidence again, as they felt the War in Iraq made them recognize the image of capitalism and imperialism that originated in Lenin's classic book about imperialism as the highest stage of capitalism. The unification of Europe gave the European left some confidence in seeking influence on a new parliamentary and political level. This was not without agony: back in the 1990s the European left was fiercely divided over the EU project and the currency union. Once they had accepted the EU and began trying to use it to their advantage, they hoped for a return to the political relevance they enjoyed in many European countries in the previous century. They failed. From a legislative viewpoint, Europe's left is almost as irrelevant in mainstream European politics as it is here in America under the informal banner of Senator Bernie Sanders. This has reinvigorated the introspective conversation on the left, about their identity and their future. I am intrigued by this conversation, for two reasons. The first, and perhaps obvious one, is that an informed, intellectual left always makes valuable contributions to the vitality of our democracy. The same goes for conservatives, whose identity crisis will probably continue for the duration of the Trump presidency. The second reason for my interest in the identity conversation on the left is that the world view they display is so vastly different from mine. In a nutshell, the left appears to believe that neo-liberalism - the definition of which appears to be similar to the traditional definition of libertarianism - has been victorious and that the world in general is now defined by this ideology. This view, which - again - I completely disagree with, is formulated into a well-written essay by William Mitchell and Thomas Fazi in the latest issue of American Affairs. Mitchell, an economics professor with University of Newcastle in Australia, and Fazi, author of The Battle for Europe, suggest that the macro-political changes manifested in, e.g., Brexit and the Trump presidency, are parts of "an antiestablishment revolt of historic proportions", during which support for traditional political parties has declined substantially. Why has the antiestablishment Left thus proven unable to fill the vacuum created by the collapse of the establishment Left? More generally, how did the Left come to count so little in global politics? Can the Left, both culturally and politically, return as a major force in our societies? And if so, how? 3. 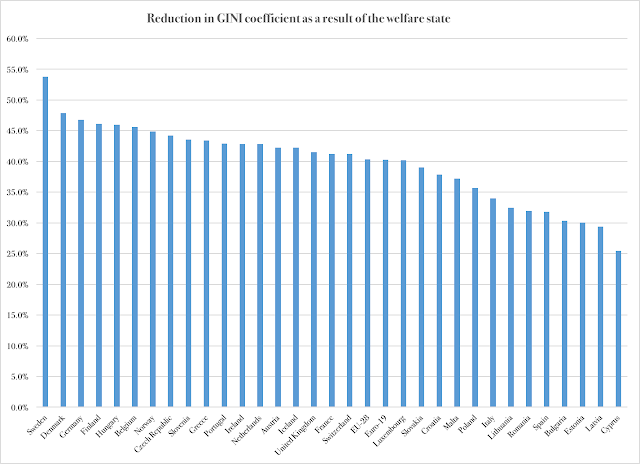 The long series of austerity episodes in several European welfare states, from Denmark in the late 1980s to Greece today. legitimate grievances of the masses disenfranchised, marginalized, impoverished and dispossessed by the fourty-year-long neoliberal class war waged from above. There is no doubt that this analysis has merit. As I explained in my 2014 book Industrial Poverty, Europe is in a decades-long, permanent stage of macroeconomic stagnation. I defined life in this new, stagnant economy as precisely that: industrial poverty. People have access to the basic conveniences of life in the industrial era, such as running water, reliable supply of essential goods and services, basically comfortable housing and utilitarian means of transportation. However, the standard of living does not improve over time; the best children can hope for, on average, is to grow up to a life about as convenient and acceptable as their parents enjoyed. Oversize government - no doubt a contentious issue for people left of center; yet as I explain in the book, and will briefly summarize in a moment, a government that consumes more than 40 percent of GDP tends to depress growth and therefore contribute to the stagnation of the very economy in which it operates. If a country, over a period longer than a traditional business cycle, meets all these four criteria, then that country is in a stage of industrial poverty. Europe, generally, meets or is close to meeting these criteria. Accepting the term as an analytical concept, we then move on to seek an explanation as to why an entire continent is in, or is teetering on the edge of, industrial poverty. I assume we can agree on the macroeconomic facts on the ground, and therefore unite around the description of the problem, namely that Europe is in a state of economic stagnation, that Europeans in general do not see any advance in their standard of living, and that future generations are at severe risk of growing up to a life less prosperous than what their parents had. We can also, I assume, unite around a largely similar description of the U.S. economy, though our growth is somewhat higher and we are notably farther away from industrial poverty than Europe is. With this problem description in place, there are two narratives as to how we ended up here: the leftist explanation that neoliberalism has won; and the libertarian explanation that the stagnation is caused by excessive government intervention into the economy. Hardly surprising, I hold up the second narrative as the correct one. But rather than arguing the finer points of free-market capitalism, I would like to highlight one false premise in the left's narrative. The left has been astoundingly successful in establishing its core ideological principle in the institutions of almost every Western government. The welfare state, for short. Referring again to one of my books, this time my new The Rise of Big Government: How Egalitarianism Conquered America, the egalitarian, economically redistributive welfare state has been so successful that it has even conquered most of the American economy and society. Economic redistribution, courtesy of taxes and entitlement programs, is so natural, so obvious and so unquestioned in the political mainstream, that it is impossible to accurately claim neoliberal victory. In most countries in Europe, government absorbs and redistributes 40-50 percent of the economy, with dependency on government for personal finances penetrating deep layers of the middle class. Never before has government participated so deeply in the economy of the free world, solely based on an ideological principle. In short: the left has not lost to neoliberalism; neoliberalism has lost to the left. There is an obvious counterpoint to my analysis: austerity. Is that not an attack on the very welfare state that I claim is the epitome of social-democratic ideological victory? No. On the contrary, austerity as exercised in Europe is a misguided attempt at saving the welfare state. Its purpose is - as Michael Tanner brilliantly sums it up in the foreword to Industrial Poverty - to make the welfare state more affordable. Austerity tries to make the entitlement system fit smaller shoes. Its effects are about as grim as when Cinderella's stepsisters tried to put on that famous shoe: crippled feet, no prince and lifelong misery. Rather than viewing austerity as a "neoliberal" assault on the welfare state, we should think of it as a desperate attempt to save the egalitarian project. The need to save it, in turn, arises from the negative effects no economic growth from the very size of that same welfare state. It is refreshing and challenging to find intelligent contributions from the left to the public policy debate. Mitchell and Fazi deserve a thank you for penning a comprehensive and read-worthy essay. My fundamental disagreement with their premises only goes to show that we need to continue a vigorous, respectful conversation about politics, the economy and ideology - and not just on our own sides of the aisle, but across it.